Smile Big For This Auction! Are you looking to purchase a bulk of web cameras? Well then you’ve come to the right place because this auction has just that for the right price! This auction features approximately 25 web digital cameras. This lot of cameras would normally cost you upwards of hundreds of dollars, but if you bid on this auction before closing time you can have a chance at bringing home a bulk of web cams for a small fraction of the price! Physical inspection of this lot is encouraged and highly recommended. Some of these cameras are either used or new and unused. If you would like to inspect these cameras in person before deciding whether or not to place a bid then you must contact the custodian ahead of time to schedule an appointment. This auction is located in Harrisburg, Pennsylvania and the closing time is on February 4 at 5:40 pm central time. Right now, the current bid is only at $85 USD and there has been 3 bidders so far, so make sure that you become the very next person to bid and have a chance at bringing home all of these amazing cameras! For any further information, simply click here to subscribe to www.governmentauctions.org for your FREE 3 day trial. Webcam by Creative: Instant Vid-Chatting! Need a quick and easy way to start video chatting with your friends and family members? This Webcam by Creative is the ideal choice! It’s simple to use—virtually just as simple as plug and play—so just hook it up to your desktop computer or laptop and you’re pretty much good to go. 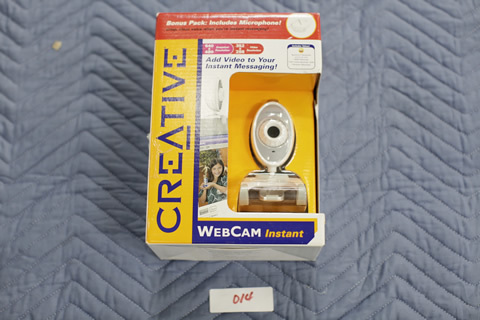 Creative is a very reliable electronics and gadgets company, so you know this webcam is a worthy item to have. It’s available at an upcoming live auction, so be sure to check it out. Our world is heading into a more digitalized state each year as technology advances, so it’s not too late to get in on the frenzy. Start by vid-chatting with this webcam if you have Skype or use the services of Google’s G-chat, or many others! You can find out about a lot more items relating to this webcam from a lot of other government auctions happening around you right now by activating your free trial! Apple iPad with Case: Bundle Deal for You!